Open your heart & home and host an exchange student Manassas, VA! Have you ever wanted to have an impact on someone else’s life? Being a host family is a great opportunity to make an impact. ETC works with the U.S. Department of State to find homes for foreign exchange students coming in with J-1 visas. We have students coming from 15 different countries, ages 15-18, who are looking for an American family to love. * Are excited to meet their American family! 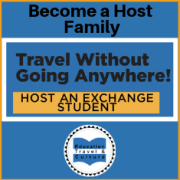 * Help an exchange student get an American education and the experience of a lifetime! Exchange students enrich the lives of their host families, peers, teachers, and the entire community! Hosting is an amazing experience and an unforgettable time for the whole family. Most people walk away with a new member of the family, new traditions, great memories and a vacation invitation from abroad!